This Technical Note presents the results of our efforts in regards to asymmetric multiprocessing on the Boundary Devices Nitrogen 7. In particular we have explored the case of reading and displaying data from an Inertial Measurement Unit, running on a heterogeneous asymmetric system. Workload is distributed across the two cores: the MCU (running FreeRTOS) takes samples from an IMU board (using i2c) and periodically sends data to the MPU (Cortex-A7, running Yocto Linux) over a RPMsg channel. Accelerometer, gyroscope and magnetometer data are then logged on the MPU by a user-space application. Another goal of this demo is to recover from a kernel panic on the MPU side. In the eventuality of a kernel crash, the MCU keeps sampling the IMU and buffers data until the MPU is up again, in order to lose as little data as possible during downtime. The IMU used in this demo is the Adafruit Precision NXP 9-DOF Breakout Board, which features the FXOS8700 3-Axis accelerometer and magnetometer, and the FXAS21002 3-axis gyroscope. This section describes how we get data out from the IMU (processed by the M4) up to the master core. The following diagram shows an overview of the application’s architecture. Instead of sending raw IMU data, the IMU polling task calculates the norm (module) of the accelerometer, magnetometer and gyroscope vectors. The three values are then enqueued in a buffer shared with the data sender task, which dequeues and sends data to the master core when it's ready. On the left side, the MPU running Yocto OE is represented. The RPMsg character driver is used to export the master RPMsg endpoint as a character device, enabling interaction with the remote device from user-space. Finally, the rpmsg_char_client userspace application interacts with the character devices in order to initialize the endpoint interface device, read incoming data and log it to a text file. Note: the RPMsg character driver was introduced in Linux kernel version 4.11. For the purpose of this demo, the driver has been backported to Linux kernel version 4.9.
heartbeat is used to signal that the master is alive (i.e. the system is up and running). When rpmsg_char_client application is started, the RPMsg endpoint on the master side is created and start_cmd is triggered; when the application is closed, the endpoint is destroyed and stop_cmd is triggered. Heartbeat is periodically triggered at a fixed rate (starting from the moment when RPMsg char driver is probed). The MCU uses a software timer to keep track of the master heartbeat. Each time the heartbeat interrupt is received, the timer is reset. If the timer expires, the remote core assumes that the master core is dead and stops sending data (while still buffering IMU data). The following state diagrams show the control flow on both sides: the user application flow on the master side and the data sender task flow on the remote side. Note: on the remote side only the state diagram of the data sender task is shown, since the IMU polling task keeps staying in the same "poll-compute norm of vectors-enqueue data in buffer" loop during the remote core lifecycle. On the MPU side, a first transition occurs when the RPMsg char driver is probed. By opening the /dev/rpmsg0 character device, the RPMsg endpoint is created. Then data is read from the /dev/rpmsg0 device and logged to a text file. Finally, the endpoint is destroyed by closing the character device. On the MCU side, the first transition occurs with the RPMsg channel creation. When the start_cmd interrupt arrives, the data sender task starts sending data to the master core and starts the master heartbeat timer. The timer is reset every time a heartbeat signal arrives from the MPU. If stop_cmd is received, the MCU suspends the data flow towards the master and keeps buffering IMU data. If the heartbeat timer expires, the task destroys the RPMsg channel and waits for the master to be up again before trying to re-initialize it. On the IMU, the sample rates are set to 800Hz for the FXAS21002 and 400Hz for the FXOS8700. 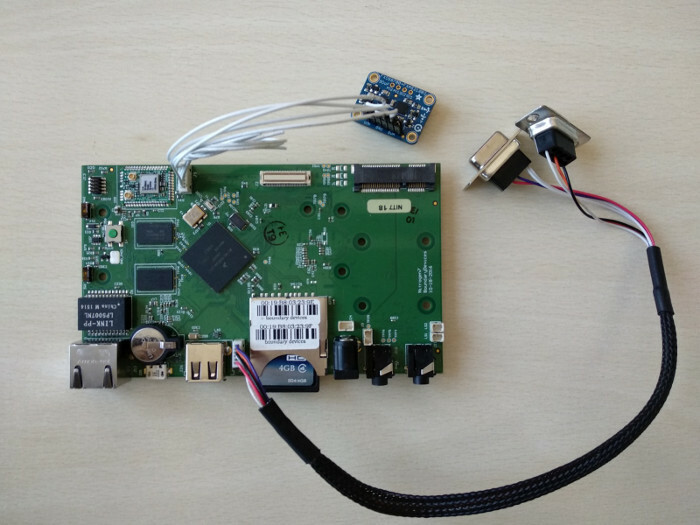 The MCU polls the IMU sensor board every 10ms and uses a buffer queue with a length of 300 elements to store the norm of the accelerometer, magnetometer and gyroscope vectors. Every 100 ms, 10 items are dequeued from the buffer and sent to the MPU over the RPMsg channel to the master endpoint. The last step is to figure out how to recover from a Kernel panic on the Linux side. Using a watchdog timer to trigger a full reboot was not an option here. 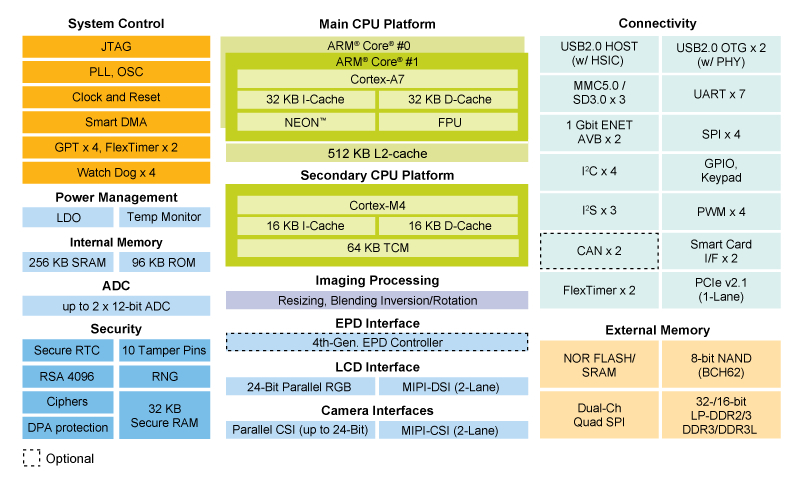 Due to the i.MX7 architecture, the Cortex-M4 would be rebooted as well. The goal is to leave the Cortex-M4 to run the application and restart only the Cortex-A7. The solution adopted for this demo is Kexec. Kexec enables booting a different kernel with respect to the currently running one. It is frequently used in conjunction with the Kdump mechanism, to both reboot into a new kernel and dump the kernel memory in case of a crash for further debugging. Kexec acts like a soft reboot, it does not reinitialize all hardware peripherals. Therefore in this case, rebooting with kexec doesn’t affect the behavior of the M4 core which can continue running. The fact that a full reboot is bypassed may leave devices in an unknown state. In this demo, all critical devices (e.g. the IMU) are assigned and handled by the M4 core, therefore they are not reset in the soft-reboot phase. The second kernel image is a lighter version with respect to the first one, in order to boot as fast as possible as an emergency kernel. kexec -d -p ../crash_zImage --command-line="console=ttymxc0,115200 root=/dev/mmcblk0p1 reset_devices irqpoll maxcpus=1"
Additionally the crashkernel=128M option is appended to the main kernel cmdline, to indicate the amount of memory reserved for the crash kernel image. Note: Kexec/Kdump support on ARM platforms is still experimental. Here are some pitfalls that have been encountered, as well as some problems that still need to be solved which requires some further investigation. When the remote core is ready to establish an RPMsg channel, it notifies the master core through a virtqueue kick function call. If this call arrives too early during the crash kernel booting, the system might hang. To overcome this problem, a delay has been added between the moment the remote core realizes that the master core is down and the moment when it tries to bring up the RPMsg channel again. Sometimes kexec hangs and does not complete the soft-reboot process. This happens more frequently when trying to continuously send data from remote to master, instead of sending a burst of data in a predefined interval. This might be due either to the many incoming interrupts or to the experimental support of Kexec on ARM; further investigation has to be done to find the root of this problem. The video shows the demo in action. The left part shows the prompt of Linux running on the Cortex-A7 (i.e. the master core), while the right part shows the output of the FreeRTOS application running on the Cortex-M4 (i.e. the remote core). First of all, the user logs in on the Linux shell and launches the user-space application rpmsg_char_client. The remote core acknowledges that the master core is ready and starts sending data through the RPMsg channel. On the master side, data is read and logged on the samples.txt text file. Then, the crash kernel image is loaded in the reserved portion of memory with kexec. As soon as the master core crashes, the remote core acknowledges it, destroys the RPMsg channel and starts buffering IMU data without sending. The crash kernel is immediately loaded on the Linux side. When the master core is up again and the user-space application is re-launched, the RPMsg channel is reinitialized and the remote core starts sending the previously buffered data to the master core. All data is recovered by the master and logged in the samples.txt file.